Ya think after you’ve been around a while, you kinda know what’s out there…the equipment, the coaches, the agents, the producers, the software, the hardware. Sometimes a mic or pre-amp comes across my radar that I missed before. but for the most part when people talk about dis ‘n’ dat pertaining to voice-acting, I’ve at least heard of it. Big mistake. There’s always something new. In past years and months, I’ve linked to prodigious lists of DAW’s (digital audio workstations). But the other day, hanging around an AudioBook narators’ forum, I heard of a new one…one that met approval from the narrators, ’cause it had special features that made punch ‘n’ roll a cinch. For freelancers like us, Reaper offers a personal single-use license for $60. Not bad for a software package with this many features. This DAW is not new on the scene, apparently (grrr). The screen is customizable, and the software comes with full documentation and help files, resource guides, and manual. The current version was just released in August 2012. 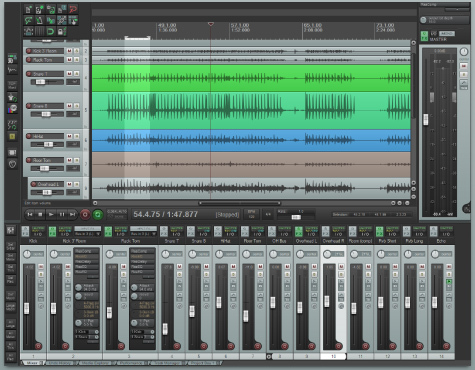 If you’ve used Reaper before, can you give us a quick word about it’s pros and cons? Thanks to Hurricane Sandy, maybe their servers are underwater! Nice thing about Reaper is it works license free until you register it, and will NEVER cripple or disable itself. It’s one of the few great “honor ware” softwares I’ve seen. I’ve been getting more and more familiar with Reaper lately, and think its punch-in abilities are actually BETTER than the venerable and expensive Pro Tools. I am working on tutorials for this software directed to the audiobook narrator, and will feature it during a webinar on ACX in a few weeks.